I did not want to be late but it was rush hour. Although I was traveling a familiar route I sought assistance by opening Waze on my smartphone. According to the Waze website it “is the world’s largest community-based traffic and navigation app” that allows you to “join other drivers in your area who share real-time traffic and road info, saving everyone time and gas money.” That sounded like exactly what I needed to make the best of drive time in this very heavy traffic. The website promised “millions of drivers… working together towards a common goal: to outsmart traffic and get everyone the best route.” Many “friends” on the road would send alerts about “police, accidents, road hazards or traffic jams, all shared by other drivers in real-time.” That was what I needed for a timely arrival at my destination. The first time I approached an intersection with a long line of vehicles stopped at the traffic light, I decided to bypass all of them waiting to go straight ahead. The right turn lane allowed me to bypass that long line of traffic. I was on my way smiling until I Waze told me that my estimated time of arrival was now 5 minutes later than before I made the turn. That irritated me. The app adjusted my route accordingly. Then I did the same thing again. And again. Each time I failed to follow the directions I was given, time was added to my ETA. I hope I am not revealing too much about myself but this was a learning experience for me. It helped me realize that instructions/directions are given for a reason. Whether it is an item with some assembly required or help with navigating a journey, my way might not be the better way. Directions/instructions are provided for my benefit. Ignoring them probably does not give me an advantage. I know that in the grand scheme of things it will not make a lot of difference if I follow GPS directions when traveling or instructions when putting together a purchased item. Short cuts may not be a better alternative but it probably won’t matter most of the time. However, in some instances ignoring the instructions can be very detrimental. This recent experience reminded me of the times I have read the Owner’s Manual of life- the Bible- but failed to follow the guidance it provided. While it does not always give specific and detailed directions for every experience, there are many directions that are pretty clear and many other principles that should not be ignored. I don’t always want to “love (my) enemy and pray for those who mistreat (me).” Often I think I have a better way of dealing with folks that are not “on my side” but I know that taking another course of action or having another attitude is not good for me. Turn the other cheek is what The Good Book tells me do to when someone does me wrong,. My natural instinct is to get even, strike back. Scripture instructs us to live peaceably with everyone but that it hard to do. I am very well acquainted with The Bible. I know it pretty well. God help me to avoid “shortcuts.” Give me the desire and ability to follow the directions of the Scripture and apply the principles in my daily life and in my relationship with everyone. According to the American Heart Association, in 2016 over 28 million U.S. adults were diagnosed with heart disease. Approximately every 40 seconds an American will have a heart attack. The estimated annual incidence of heart attacks in the United States is 720,000 new attacks and 335,000 recurrent attacks. A report from the U.S. Centers for Disease Control and Prevention’s (CDC) National Center for Health Statistics shows that about 1 of 3 U.S. adults—or about 75 million people—have high blood pressure. The number of hypertension-related deaths increased 61.8%, from 2000 to 2013. There were more than 360,000 American deaths in 2013 that included high blood pressure as a primary or contributing cause. That is almost 1,000 deaths each day. In 2018, it was predicted that an estimated 1,735,350 new cases of cancer would be diagnosed in the United States and 609,640 people would die from the disease. You probably have heard these or similar statistics but perhaps the following is news to you. The U.S. Census Bureau estimates the total population at 328,456,820 people, with 77.1 percent (252,911,751) of those people being over 18. The American Psychiatric Association says that depression affects an estimated 1 in 15 adults (16,860,783) in any given year. And one in six people (54,742,803) will experience depression at some time in their life. Is it just me or do we not hear as much about depression than other health issues? Am I just imagining that mental health concerns are often mentioned in a whisper but physical health matters are spoken of openly? The American Psychiatric Association tells us that “depression (major depressive disorder) is a common and serious medical illness that negatively affects how you feel, the way you think and how you act.” Depression causes feelings of sadness and/or a loss of interest in activities once enjoyed. It can lead to a variety of emotional and physical problems and can decrease a person’s ability to function at work and at home. Fortunately, it is also treatable. The National Institute of Mental Health (NIMH) identifies depression as one of the most common mental disorders in the U.S. and “current research suggests that depression is caused by a combination of genetic, biological, environmental, and psychological factors” and it can happen at any age. Medical professionals recognize that depression “is not a passing blue mood, which almost everyone experiences from time to time, but a complex mind/body illness that interferes with everyday functioning. … It alters the structure and function of nerve cells so that it disrupts the way the brain processes information and interprets experience. Despite feelings of hopelessness and worthlessness, depression is a treatable condition” (Psychology Today). Most people with depression feel better with medication, psychotherapy or both. While health professionals acknowledge that depression is common among Americans, the biggest obstacle to treatment is the stigma that often is associated with any form of mental illness. I encourage you to learn more about depression and other mental illnesses and discover how you can be a part of the healing process. What do you say when you have nothing to say? Perhaps it is best just to be quiet. Don’t say anything. What do you write when you have nothing to write? Nothing! 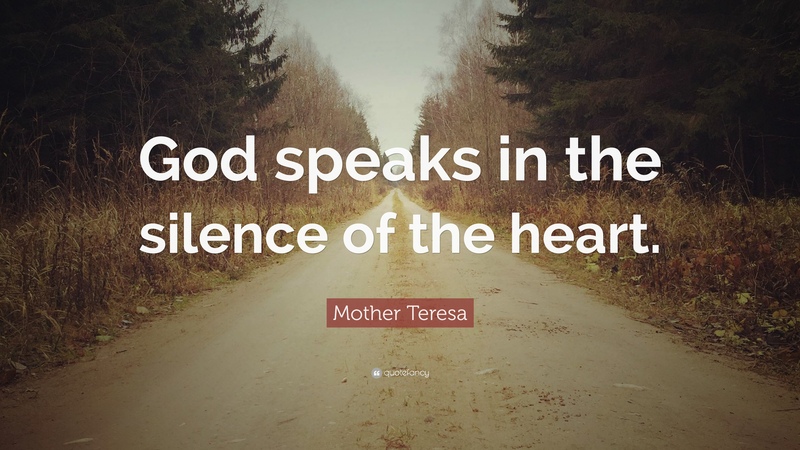 Silence and the blank page are intimidating but perhaps they are trying to free us from feeling the responsibility of always having helpful information or conversation. Maybe we need to listen and learn rather than talk or write. So today I leave you with nothing or everything to ponder. Enjoy! It is easy for us to be busy, even doing the work of the Lord, but forget to nurture our own spirits and care for our own souls. One of the pitfalls of modern living is the tendency to channel all our time and energy into our “work” and neglect our “walk.” Without attention to our spiritual well-being, the results are likely to be like Foster’s experience. We find ourselves empty and exhausted. Or we can easily succumb to the seduction of success rather surrender ourselves to lives of significance. The prophet Isaiah has words of instruction for us: “God lasts. He’s Creator of all you can see or imagine. He doesn’t get tired out, doesn’t pause to catch his breath. And he knows everything, inside and out. He energizes those who get tired, gives fresh strength to dropouts. For even young people tire and drop out, young folk in their prime stumble and fall. 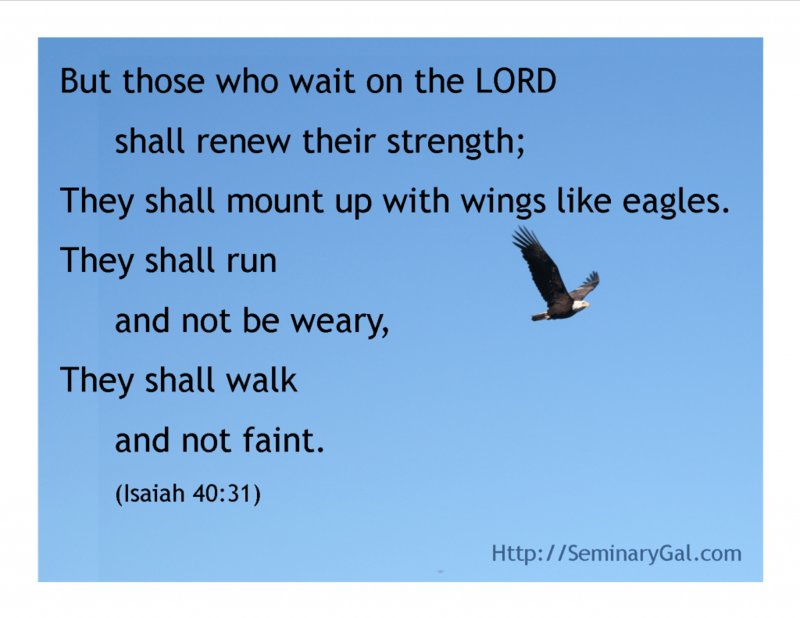 But those who wait upon God get fresh strength. Dear God, help us not to get so caught up in our work, whether it be for You or for our own self interests. Enable us to realize that our “doing” must not take precedence over our “being.” During these days of Lent help us to realize that our strength and purpose comes from our relationship with You. Garth Brooks is the best selling solo albums artist in the United States, ahead of Elvis Presley, and is second only to the Beatles in total album sales overall. He is also one of the world’s best selling artists of all time, having sold more than 170 million records. In one of Brooks’ songs, The Dance, he reflects on a failed romantic relationship. One moment “all the world was right” and then it was over. Dancing underneath the stars he remembers feeling that “Holding you I held everything.” He felt like a king but then the king would fall. In spite of this negative experience he does not bemoan the fact of failure. Instead he suggests that although it was painful, he was glad he “didn’t know the way it all would end, the way it all would go” because if he had missed the pain he would have also missed the dance. I have heard it said that there is no gain without some pain. Most often this comment is related to physical fitness. The premise is that the harder you work your muscles the greater the reward will be. The principle also points to a spiritual lesson. In the 2nd Century Rabbi Ben Hei Hei said “According to the pain is the gain.” The suggestion is that spiritual growth (gain) is accomplished by enduring the “pain” of doing God’s will rather than following one’s own desires. The message is simple but not easily achieved. In Psychology Today, Romeo Vitelli says that there are three primary factors to what he calls psychological resilience- the ability to survive and grow from difficult circumstances. The first of these is self-regulation (control), or the ability to control impulses, manage difficult emotions, and being able to carry on despite setbacks. Vitelli goes on to say that it is very helpful in dealing with traumatic life events or emotional distress if a person also has supportive relationships of family and friends. The third component to overcoming traumatic experiences, Vitelli calls “meaning-making.” By this he is referring to the ability to understand and to explain what someone is experiencing. I agree with Dr. Vitelli that all three of these components are essential for healthy response and survival of difficult and traumatic experiences. But I would add that he has missed an important element, especially in what he calls “mean-making”- faith in God. While humans are incredible creatures endowed with remarkable abilities, we are all fallible beings. It has been said that into every life some rain must fall but how we respond to circumstances determines whether we gain or lose from that experience. Heredity, environment and many other factors impact every person. Our ability to cope is impacted by a multitude of things but there is one promise that is equally accessible. Jesus said, “trust in me and you will be unshakable and assured, deeply at peace. In this godless world you will continue to experience difficulties. But take heart! I’ve conquered the world” (John 16:33, The Message). He was sitting in his car outside a CVS waiting for his wife who was inside shopping. He was a successful and generous businessman. He was not in a “bad” neighborhood. He was not involved in any questionable activity. Just waiting for his wife to finish shopping. Then someone shot him and killed him. A 7 year-old girl was riding in a car driven by her mother. She was still in her pajamas along with her three sisters on a quick run to get coffee on Sunday morning. They were stopped at a red light near a Walmart and someone pulled up next to their car, started shooting and Jazmine Barnes was killed. Just days before the second grader was in the holiday program at her school. Officials say it was a case of mistaken identity. After a house fire, a 67 year-old man and a 65 year-old woman were found dead in their home. Fire officials said that the fire was intentionally set. It was later determinded that the married couple had been strangled. Their son has been arrested and charged with murdering his parents. It’s a normal day at school and then a nightmare. A crowd is enjoying a night of musical entertainment and then shots from a hotel room high above the venue and dozens die. A young man is on his way home from a Braves game when someone cuts him off on the freeway. The two drivers argue as they continue to drive. This encounter ends when one of the men shoots and kills the other. A young girl is in her bed at night when someone kills her parents and kidnaps her. These are just a few examples of daily occurrences in communities and neighborhoods all across America. What has happened to the value of a human life? Former President Bill Clinton said, “…each bloodletting hastens the next, and as the value of human life is degraded and violence becomes tolerated, the unimaginable becomes more conceivable.” Have we come to the place in our society where we have come to expect that which was once unimaginable? Has the worth of a person become so small that we see others as dispensable? Abhijit Naskar is one of the world’s celebrated neuroscientists, an international bestselling author and untiring advocate of mental wellness and global harmony. He suggests that “Human progress isn’t measured by industry, it’s measured by the value you put on a life.” If that is the case, we have not progressed very far. The Apostle Paul affirms that God “gives to all life, and breath, and all things” (Acts 17:25). It is thus clear that Scripture regards life as a gift from Heaven. If human life is a gift from God, then it is a sacred essence, and no person has the arbitrary right to take it from another or to destroy it within himself. God help us to value life as a divine gift and end this move toward absolute destruction. One of our Founding Fathers, John Dickinson (1732–1808), wrote the lyrics to “The Liberty Song” in 1768. In the song he wrote: “Then join hand in hand, brave Americans all! By uniting we stand, by dividing we fall!” Patrick Henry used the phrase in his last public speech in which he denounced efforts to advance states’ rights. Many popular songs have used the theme “United we stand, divided we fall.” The Brotherhood of Man, Sonny and Cher, Elton John, Pink Floyd, Tupak Shakur, and many others have asserted that belief. This phrase has been attributed to the ancient Greek storyteller, Aesop. One of Aesop’s Greek fables tells of four oxen who lived in the forest. They were very good friends and always went together to graze in the fields. However, every time they went, a hungry lion tried to attack them. The lion longed for their meat but they withstood his attack by fighting him as a team. They attacked him with their horns and the lion fled to another forest. One day, the four oxen fought among themselves. They started going to the forest separately. When the lion returned, he saw that the group was divided and he planned to take advantage of this situation. Finding the first ox grazing in the fields alone, he crept from behind and ate him up. The next day, he attacked the second ox and killed it. This way he killed the third and the fourth ox too. Had the four oxen stayed together, they wouldn’t have lost their lives. A similar phrase also appears in the New Testament Gospels of Matthew, Mark, and Luke. Jesus declares that unity within oneself is essential as he proclaims, “If a house be divided against itself, that house cannot stand” (Mark 3:25, Matthew 12:25, Luke 11:17). Surely what is true of the individual is true of any corporate entity. The makeup of a human being is incredibly complex. There are several main systems that make up the human body and each has a different function. The cardiovascular, digestive, and nervous systems are not identical but when they, and other systems, work in unity a healthy individual is the result. Jesus is not suggesting a simplistic thought. But unity is essential for the health of the body, nation, church, family, and society in general. Lord, unite our hearts, minds, and spirits so that we can stand together. * This was originally written for a devotional booklet (Prayers, Politics, and Peace) for the Peachtree Road United Methodist Church, Monday, November 14, 2016. Today is Valentine’s Day. It is a day when candy, flowers, and gifts are exchanged between loved ones. The origin of this holiday and its theme of romance is not clear and there is much mystery about its patron saint St. Valentine. Theories include aspects of early Christianity, ancient Roman tradition, and customs of Victorian England. According to one legend, an imprisoned Valentine actually sent the first “valentine” greeting himself after he fell in love with a young girl–possibly his jailor’s daughter–who visited him during his confinement. Before his death, it is alleged that he wrote her a letter signed “From your Valentine,” an expression that is still in use today. By the Middle Ages Valentine had become one of the most popular saints in England and France. It has also been suggested that in the 5th century when Pope Gelasius declared February 14 St. Valentine’s feast day it was an effort of the Church to “Christianize” the pagan celebration of Lupercalia which was celebrated on February 15. Lupercalia was a fertility festival dedicated to the Roman god of agriculture, and to the Roman founders Romulus and Remus. It was not until the Middle Ages that Valentine’s Day became definitively associated with love. In those days it was commonly believed in France and England that February 14 was the beginning of birds’ mating season, which added to the idea that the middle of Valentine’s Day should be a day for romance. Although Valentine greetings were popular as far back as the Middle Ages, written Valentines didn’t begin to appear until after 1400. The oldest known valentine still in existence today is believed to be a poem written in 1415 by Charles, Duke of Orleans, to his wife while he was imprisoned in the Tower of London. Depending on how you interpret the statement above I am either a very fortunate human being or an arrogant individual. The Bible cautions that “pride comes before disaster and arrogance before a fall” (Proverbs 16:18 CEB). One source defines pride as “a feeling or deep pleasure or satisfaction derived from one’s own achievements, the achievements of those with whom one is closely associated, or from qualities or possessions that are widely admired.” This definition allows for pride to be a positive or negative emotion, depending on what prompts the feeling. It can be self-centered or other oriented. In other words, pride can be viewed as a virtue or a vice. With all that said, I am a proud man. It is up to you how you understand that. I am proud of my family- my wife, three adult children, their spouses, and two grandchildren. I am proud of my country. I am proud to be a Christian. I am proud to be a United Methodist clergy person (retired). I hope I am not “puffed up with pride,” arrogant, or obnoxious. I don’t think I am blind to imperfections. I, and all of the above mentioned of which I am proud, are not always right. I (we) are not necessarily better than any other. We are different, but not superior. I am proud of who we are and pray that God will continue to mold and shape us until we become all that God intended for us to be. *This was first posted on Thoughts For Thursday on July 9, 2015. Helen Hayes was often introduced as “First Lady of American Theater” for her outstanding accomplishments on stage and screen. She is one of only 15 people who have collected an Emmy, a Grammy, an Oscar and a Tony Award. Hayes also received the Presidential Medal of Freedom, America’s highest civilian honor, from President Ronald Reagan in 1986. In 1988, she was awarded the National Medal of Arts. Ms. Hayes began her stage career at an early age. With her mother’s encouragement she attended dance classes as a youngster and made her stage debut as a five-year-old singer at Washington’s Belasco Theater, on Lafayette Square, across from the White House. At age nine, she made her Broadway debut as Little Mimi in the Victor Hugo operetta Old Dutch, and at age 10 she was cast in the one-reel film Jean and the Calico Cat. As followers of Jesus Christ we are not called to be successful but we are expected to apply ourselves and do our best at everything we do. The Apostle Peter instructs us to do everything so that God will be honored (I Peter 4:11). The Apostle Paul also emphasizes that everything we do should be for the glory of God (I Corinthians 10:31). Lord, help us to live as faithful disciples striving to be the best we can be always seeking to serve others.